Richard Smythe is making a splash in the book world with his first three books: Beep Beep Beep Time for Sleep, Water Song, and Dozy Bear and the Secret of Sleep. He’s been drawing since he was little, when he would deface his sister’s homework. Since then he has received an MFA in illustration from the University of Hertfordshire. Richard lives in the United Kingdom. Visit him online at Richard-Smythe.co.uk. McCanna's carefully chosen words are nearly all onomatopoeia, a cacophony of water sounds that resonates on tongue and ear, demanding to be read aloud. . . . Beautiful. McCanna’s use of onomatopoeic words helps the natural scenes come to life, as do the spare rhyming text; both will aid preemergent readers. The delightful full-spread illustrations and the size and colors of the text add to the mood of the prose. A pitch-perfect selection for a drippy afternoon or for a tuck-in story after Mom or Dad has dragged home late from work. The rhythm of nature and the beauty of a rainfall and its aftermath suffuse this simple story, as enticing pictures and rhyming language encourage readers to follow an orange fox. Padding through the marsh, the fox passes animals of the wetlands. A lush vocabulary of onomatopoeic sounds abound: ducks “splish splosh swish slosh,” dramatic white rain droplets “drip drop, plip plop,” and the rushing river goes “trickle dribble gurgle burble babble bubble.” As the fox hurtles down the river—“POP!”—it goes down a cascade in the rapids and ends up in a log, as leaves and branches swirl in the wind. Finally, with a glorious “whoosh sigh,” a dazzling rainbow appears. The fox finds its family and joyfully leaps through the sparkle and glitter. Full-color spreads in realistic watercolor depict a changing landscape and the plant and animal life of the watershed. The afterword gives information on the aquatic ecosystems, the progression of the water cycle, and the habitat of the omnivorous fox. A joyful, gorgeous book. Tim McCanna’s language is both melodious and spare, with only a few evocative words on each page (“squish squelch glop”) that capture both the diversity of water sounds and the music of language. 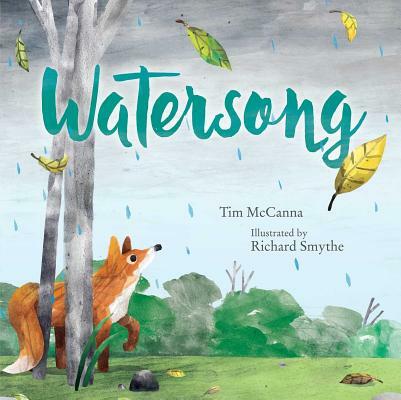 Richard Smythe’s ravishing illustrations mine the depths of grays and blues, zooming in to watch a mouse duck for shelter and then whirling to the sky to show the fox tracking an inundated stream. . . . Watersong [is] the rare book that can satisfy toddlers and bigger kids at the same time.